One hour doc explores the lives of the one in ten people named after Pope John Paul in 1979. 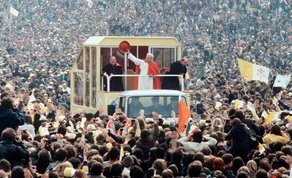 The John Pauls tells some of the stories of the one in ten people that were named John Paul after the historical Papal visit of Pope John Paul II to Ireland in 1979. Now aged 38 and 39, what has become of these John Pauls? This one-hour documentary will find out how their lives panned out over the last four decades during a period of unprecedented economic and social change in Ireland. They are a diverse group of individuals from all walks of life united by one thing – their parents chose to name them after a Pope. Featuring twelve John Pauls from across Ireland, they talk about their personal experiences of education, parental separation and divorce, addiction, the church, relationships, homosexuality, marriage, adoption, loss, faith and religion, sport, family and career. We will also hear from Karol Maria Ryan parents chose to name her after Pope John Paul II birth name Karol Józef Wojtyla. Two weeks after the visit of Pope Francis to Ireland, The John Pauls will tell us a lot about who we were and who we are as a nation in 2018.